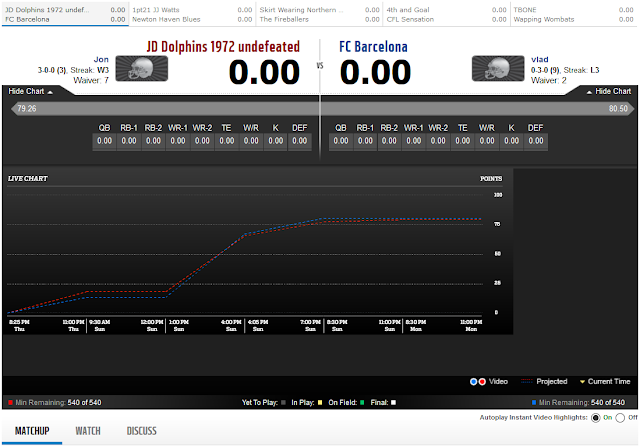 Week four starts tonight and my Dolphins are looking to go 4-0 to start the season. Up next would appear to be a favourable match-up against the 0-3 FC Barcelona, but due to some tough fixtures for my players this game could be a lot closer than expected, in fact the prediction is for FC Barcelona to scrape through with a victory, 80.50 - 79.26. Of course we have had the odds against us in previous match-ups but this one feels a little tighter than before. With that in mind let's take a look at some of our likely starters this week. 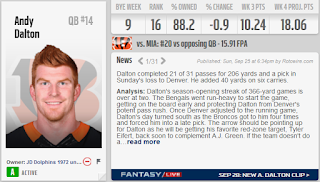 For the first time this season I am leaning towards Dalton as my starter instead of Carr. This decision would have been an awful lot easier had Tyler Eifert been declared fit to play but as he is doubtful there is a lot more room for doubt in my mind than I am comfortable with. However, he does have the more favourable match-up against a Miami defence that is yet to perform anywhere near the levels that their contracts suggest. Adam Gase read the riot act to the team in Miami this week which could kick them into gear, especially as Cincinnati have already allowed Dalton to be sacked 12 times this season, and Miami's front seven are meant to be pass rushing experts. On the other hand, Derek Carr and the Raiders travel to Baltimore this week against a defence that hasn't exactly been great for opposing QBs. I think Dalton may just edge it but it is a close call. They won me the game last week, both putting up massive numbers, and it would be very difficult to sit either of them after their respective performances. 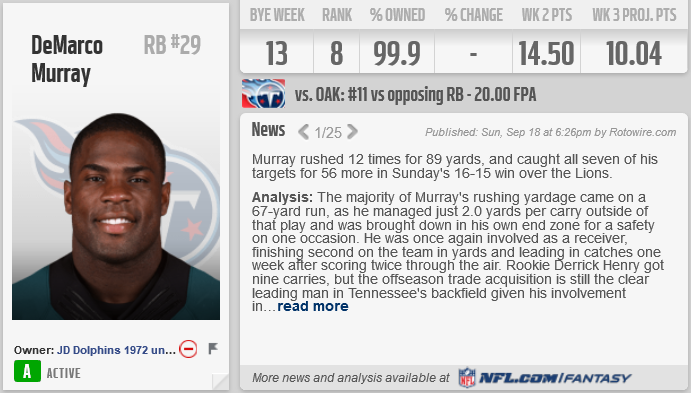 Murray is up against a Texans defence that just lost JJ Watt, potentially for the season, which should help him continue as a running and receiving back this week. 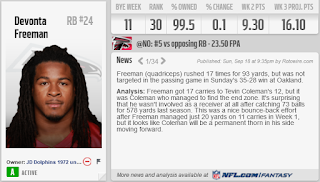 Devonta Freeman had a massive game against the lowly Saints defence last week, but this week should prove to be a tougher assignment against a smarting Panthers defence. 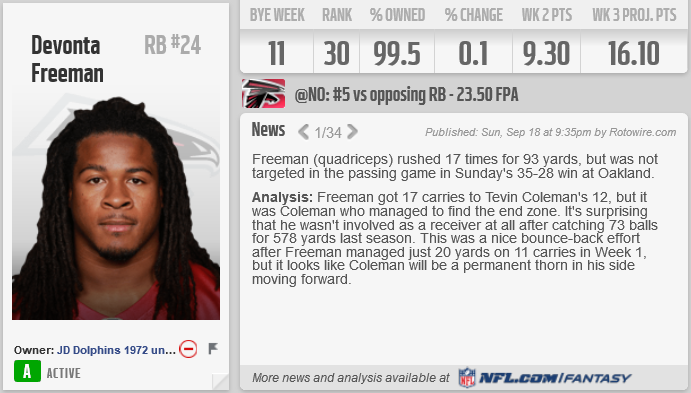 Atlanta vs Carolina will be a battle for supremacy in the NFC South and both sides will be looking to make the most of their weapons available which should be good news for Freeman after he became involved in the passing game last week. 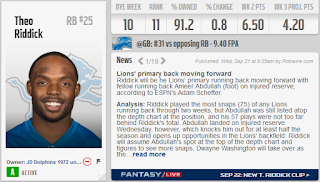 My only other option right now is Theo Riddick, with Doug Martin out, and it is just too difficult to sit either of these two starters with Theo looking a little pedestrian right now. This was a tough call. 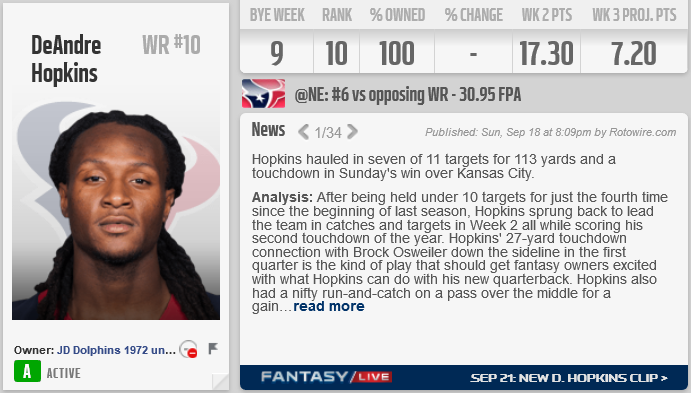 Benjamin and Hopkins both let me down in a big way last week but once again they have the more favourable match-ups this week, at least on paper. Benjamin is up against the New Orleans defence that allowed the Atlanta Falcons to run amok in week 3 and Oakland in week 1. Nuk faces a Tennessee defence that should be a lot easier for him to pick apart than New England last week. With Matthews and the Eagles on a bye this week my only other options are Alshon Jeffery and Michael Crabtree. Jeffery is once again limited in practice and with a questionable QB situation, and an even worse O-Line, it seems almost impossible to start him right now. The Bears need to turn it around quickly if they want to make this season respectable. 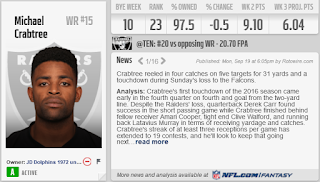 Crabtree on the other hand has a very settled situation in Oakland and he was the go to guy last week. The only issue here is that tough match-up in Baltimore, he needs Carr to get him the ball and the question is will he be able to do that in Baltimore? 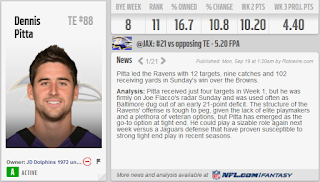 He was out performed by Gary Barnidge, who I dropped to bring him on board, but still put up decent numbers for a TE. He faces an Oakland D that, whilst they improved last week, are still liable to give up big plays. 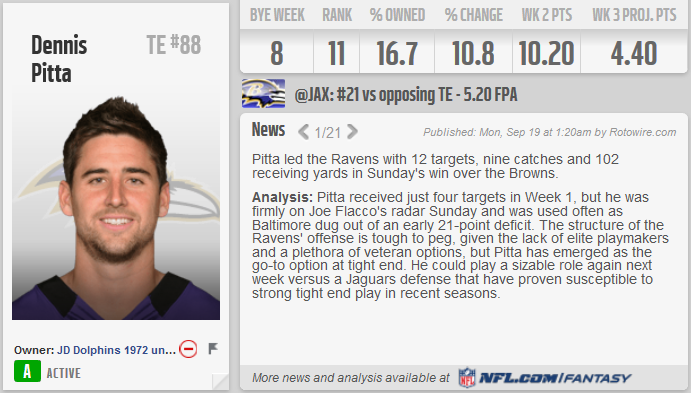 Joe Flacco is still likely to rely on his big TE and this makes Pitta a must start for my team. This one is going to give me a few more sleepless nights. On the one hand Theo Riddick is up against a Chicago team in turmoil and he wants to prove to everyone that he can be the number one back with Abdullah out in Detroit. 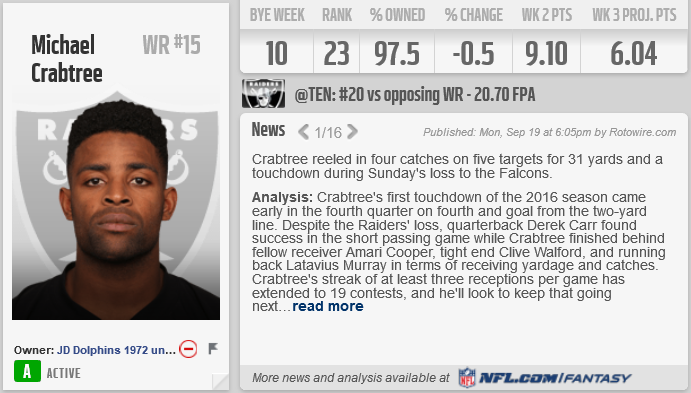 On the other hand however is Michael Crabtree. Pretty much guaranteed to give me 3 catches or more, averaging bang on 10 points a week and getting the majority of the looks from Carr last week. Both have boom or bust potential this week and in a situation where I need to make every position count both of these options feel like a gamble. Of course I could throw a spanner in the works here in the form of Alshon Jeffery... But let's not get completely crazy. He had a quiet week last week, and it could be the same again this week against a Pittsburgh team who were embarrassed by the Eagles in Philly and will be looking to set the record straight. KC should continue to move the ball on offence, it will just be a question of whether or not they can get it in a position for Santos to make something of it. The last two weeks the Rams have looked better. Sure giving up 26 points to Winston and co in Tampa wasn't ideal but that was to be expected with someone like Winston slinging the ball out all over the field. Add to that the errors they caused the Bucs to make and it wasn't a terrible performance, just not quite to the same level as the game against Seattle the week before. Up next are Arizona who were shown up by Buffalo last week. Carson Palmer will want to get the Cardinals back on track and LA will need to be back at their best if they want to stop him. There seem to be a few low expectations for my players this week, so I can only hope that they outperform these and lead us on to a 4-0 start, pushing us on towards exceeding our pre-season prediction of 2nd place.